There was always music in our family house. My mum played the piano, accompanied by the clicking of her long red nails on the keys. My older brothers also took piano lessons. I had a blue plastic ukulele which I liked to scrape with a cane, having enjoyed hearing violins in a local variety orchestra. And there was the gramophone and a lot of Gilbert & Sullivan, Will Fyffe and Harry Lauder. To this day, I don't think it matters too much what music a youngster is exposed to, as long as there is music and people appreciating it. When my turn came, I was sent to piano lessons, probably a year too soon, and didn't make a lot of progress, especially in the summers when the daylight hours were for cricket, and cricket alone. The piano taught me sightreading and basic keyboard harmony, so it wasn't a wasted experience, but I still don't get along with keyboards. Then one day the school music teacher announced that some orchestral instruments were available if anyone was interested. It turned out she had a cello, a bassoon and a flute, returned by recent school leavers. I asked for the cello but she said it needed repair. So I asked for the bassoon but she said my hands were too small (not true - I was always spider-fingered). So, mildly disappointed, I settled for the flute. I took to the flute pretty well. I had a great teacher, Adam Bennett, who concentrated on tone production above all else. No gas pipes effects allowed! But he also told me after a year or so that the school instrument I'd been given was really holding me back, as it was of poor quality and in need of a major overhaul or better still, to be recycled as a fire poker. 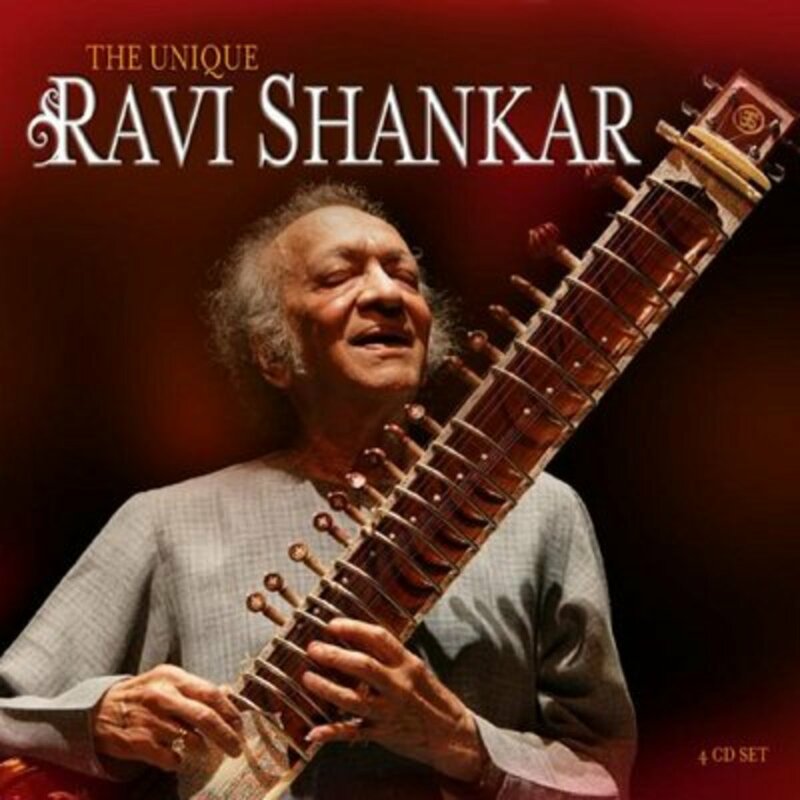 What I didn't know was that he'd had the same conversation with my father who, on an impulse, went to Biggars Music Shop in Glasgow and came home to surprise me with an Artley Concert Flute, second hand, but in perfect order. Going to Biggars was a good move. For a non-player to buy a musical instrument for a musician is a very high risk and not to be recommended. But the staff in Biggars were/are knowledgeable and experienced and sold him a good quality instrument at a fair price. 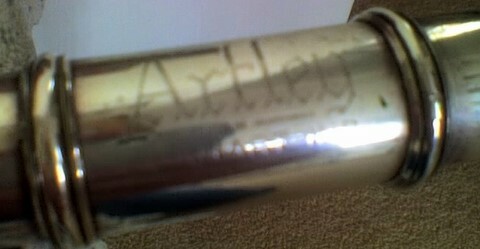 The Artley is not a sterling silver instrument. 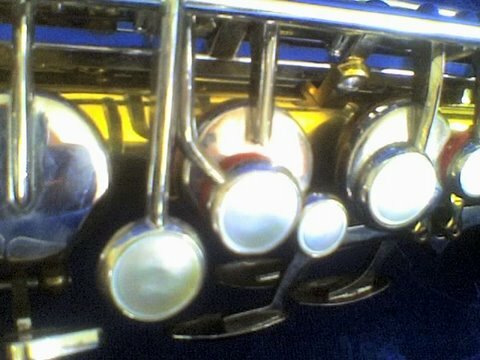 It is electroplated nickel silver, and over the 43 years I've owned and played it, my finger acids have taken their toll on the key plating (see picture above). But the tone and intonation over the full range are as good as ever (when I'm in practice!) and the playability is far better than many more expensive instruments I've tried. It has been re-padded once only, and three or four times I've stripped down the entire mechanism for cleaning and lubrication. I was so nervous the first time I did that, in case I couldn't put it back together again, that I forgot all about the lubrication and had to repeat the entire process. The Beatles have a lot to answer for. How could you be a teenage musician in those years and not want to play guitar? But the school didn't entertain guitars and having recently been given a flute, I wasn't going to ask for a guitar too. The only option, then, was to start saving. I was 15 or 16 when I lashed out £9 while on holiday in Spain for a very basic classic guitar. When I got it home, I set about learning from a TV series, Hold Down a Chord with John Pearse. I also bought a book of flamenco guitar and started learning some of the forms, aided by records (also brought back from Spain). And of course I learned that my guitar was a heap of junk! But it was still better than what you could get for the same money in Britain, so I sold it for £10, put another £5 to it and, on holiday again, bought a much nicer Spanish classic guitar which has been my constant travelling companion for 40 years, wherever I've lived and worked. It's not my best instrument, but it will always be my favourite. We've been in more bars and bedrooms together than I care to remember. The guitar on the right is neither of the above. By 1970, I was playing classic guitar seriously and wanted a quality instrument. This one is made by Taurus (which people often mishear as Torres - no such luck!) and is as good a classic as I will ever need. It is beautifully constructed, with a rosewood fingerboard, and an unusual jet black finish to the sides and back. It has no strings in the picture because it was while changing the strings I had the sudden notion to photograph and write about my best instruments. Normally, I fit it with Augustine Blue strings or sometimes Aranjuez Gold. I was playing flute in a folk-rock band for a while. But the band gradually morphed into something louder and heavier where the flute wasn't really needed. The choices were, leave the band or make more noise. I also had an electric guitar (a bright red Hagstrom) by this time, but we had enough guitarists. 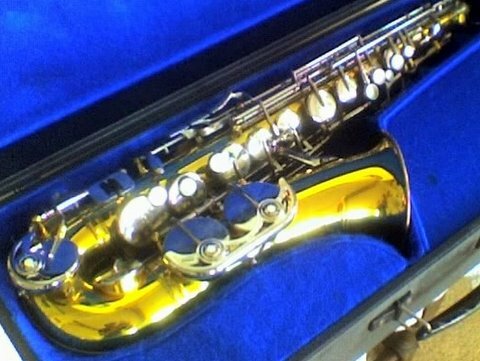 So, as I was now working for a living and had bit more spare cash, I decided to take up the sax, and bought the one on the right, a pretty basic alto. I don't consider myself a saxophonist. I can bash out riffs in a rock band, but my attempts to sit in with the sax section in a Glenn Miller style big band were fun but a failure. These guys were all in their fifties and sixties and had been doing it all their lives. I'm glad to have tried it nonetheless. It's a great sound to be in the midst of. But String of Pearls was my downfall. The solo goes to second alto because the first is on clarinet. And I couldn't hack it! Flamenco - I love it. In Britain and even more in America, people often think of Flamenco as a guitar based music. But it's not. The Flamencos sing and dance. And if there are no guitars, there are feet to stamp, hands to clap, fingers to snap, tabletops to beat. Flamenco is the compas, the structure and rhythm. Cante Jondo (deep song). Cante Chico (light song). Possibly the best living Flamenco guitarist, Juan Martin, travels with his troupe of singers dancers and guitarists and is content to spend most of a recital in the role of accompanist to the song and dance. His occasional guitar solos are just to please his fans, not himself. I have spent many nights playing Flamenco into the darkness (it's an improvised music; unlike classical guitar, you don't read it. You play by ear). And for years, I played it on my aging 'travelling' classic guitar. But there are two reasons why you shouldn't really play Flamenco on a classic. 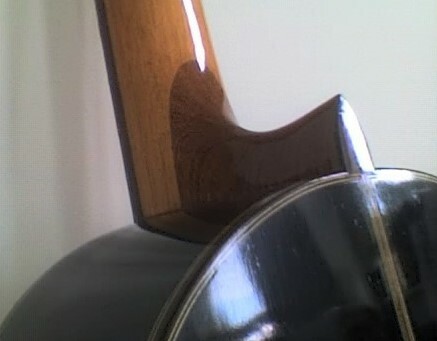 One, the tone quality is never right, and two, Flamenco rhythm techniques can do physical damage to the soundboard of a classic. So, one day in London, walking by the Ivor Mairantz Music Centre, on a whim I went inside and asked to try some Flamenco Guitars. I tried three, dragged myself out of the shop empty handed and returned the next day to buy no.2 (pictured right), a Spanish built Cayuela Flamenco instrument. Flamenco guitars have thin scratch plates to protect the soundboard and are shallower bodied than classics. They are also of lighter construction throughout. All of which combines to give a distinctive bright, sharp tone and crisp articulation. 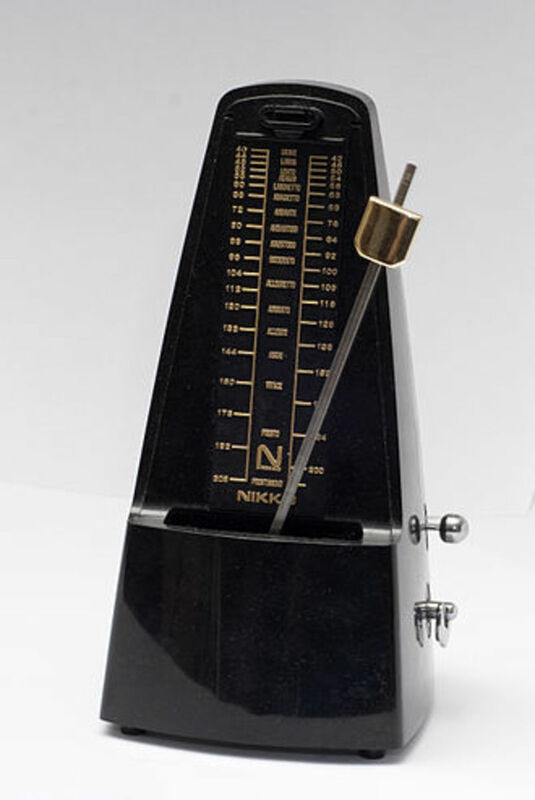 Very traditional instruments still have wooden tuning pegs instead of machine heads, but as this doesn't alter the tone and merely makes tuning difficult, it is beginning to die out. A love of classic guitar inevitably introduced me to early music from the lutenists and vihuelists of France, England and Spain. And there is no doubt that this music (like most music) sounds best on authentic instruments. Perhaps the high point musically from the Renaissance was the lute of John Dowland, court musician to Queen Elizabeth. 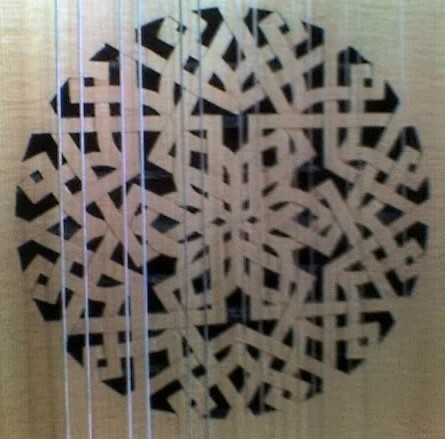 My lute is a modern reproduction of Dowland's style of instrument. It has 13 strings in seven 'courses' or pairs, with the top string only being single. It is tuned a minor third above the classic guitar (though this doesn't take account of the changes in pitch down the centuries). The lute is quite tricky to play. Because the string tension is much lower and the construction much lighter, I've had to learn to use a far less 'muscular' technique than suits the guitar. Then there is the difficulty of keeping the instrument on my lap when playing. The rounded back is naturally unstable and it has a tendency to slip forwards at the worst possible moment. I haven't dropped it yet, but it's been close. A few more technical details about the lute, mostly for guitarists: the strings are tied directly to the bridge but do not pass over any 'bone'. The frets are not metal but are actually of gut (or nylon) tied around the neck. Renaissance lutenists used to fine tune their instruments by sliding the frets up or down to suit different keys. My lute is strung with nylon, not the traditional gut which offers no advantages beyond the feeling of authenticity. In the old days, quality gut strings were so rare that people used to joke that lutenists spend half their lives tuning their lute and the other half playing out of tune. That's why I stick with nylon. 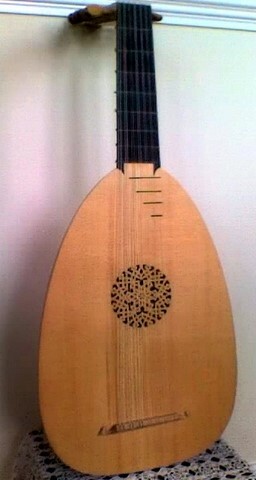 My lute was a 25th anniversary present from my wife. It is far too precious and fragile to carry around the Middle East, so it only gets played on my visits home. But becoming an accomplished or at least a halfway competent renaissance lutenist is my number one retirement project (and maybe not so far away). Like many musicians, I have accumulated instruments over the years. The ones I've featured here are all special to me in one way or another. But the full list would also include: a new Yamaha electro-acoustic, a djemby, bongos, harmonicas, a piano, a piccolo, a jaw-harp, a ukulele-banjo and a motley collection of whistles, fifes, schaums, etc. I can totally relate to your story. Even though I am not a musician, my husband is, and he cannot pass a second-hand music store without going in to see what kind of instruments they have. My living room looks like an instrument museum! Thankfully, I love music. Thanks James. As I'm sure you can imagine, on my trips home I can shut myself away for hours- there isn't time enough to play all of them! I so enjoyed reading about your musical experiences and all of these lovely instruments. I am a professional Trombone player and conductor. Have been in music for over fifty years. Thank you Reginald. Are you a musician (amateur or professional) yourself? Great article! Terrific story of your early years. And I loved seeing the instruments. Bravo! Hi Stella - sorry for late response. Almost impossible to part with musical instruments, isn't it! It sounds exactly the same, year, make and model. Mine has matured into a very playable, fine toned instrument. How about yours? I have the same classic guitar made in spain. My father was spanish and bought this guitar call exactly Taurus, year 70, model 54, made by "musical amporium, llobet and cia, Barcelona. " Is it the same ? I am particularly fond of the piano! Thanks Katie - last visit home I also brought the flute out to the Middle East, so I now have more options here. From the picture, it looks like a classic (I can't see any scratch plates, but Cayuela uses transparent ones so they might be there). None of the pics show the depth of the body, so again it's hard to be sure. At $350, in good order, I'd say it's probably a good deal. 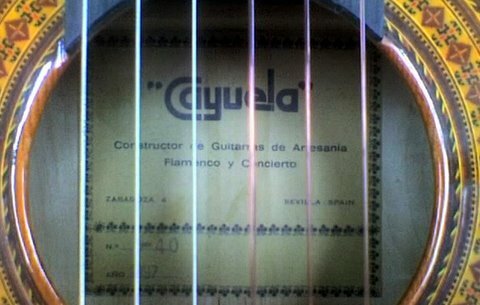 hi , do you know anything about the Cayuela Frontera 01 model , is it a flamenco or classical anything would be great. thank you. Hi Nick - thanks for visiting here too. I've never regretted stretching the purse strings for a better instrument. 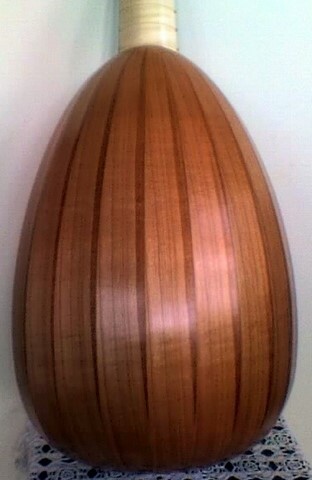 With care, all acoustic or natural instruments can give a lifetime's pleasure. Not bad for a few hundred pounds. Maita - keep playing. even 5 minutes a day will get you there! Hi Jeff - musical instruments are more than mere possessions. They become part of you after a while. Thanks for commenting! I love my guitars, banjos, mandolin, piano and various other instruments of mass musciality. Great hub - great photos! awsydney - thanks for visiting. I'll be reunited with the lute in a couple of weeks on my next trip home. One of the many things I'm looking forward to. Hi Paraglider, I like the look of the beautiful lute. That's the instrument in one of Sting's albums. You're definitely correct in saying a music instrument is for life, to be passed down from one generation to another. Well done! I hope to write a few more hubs about music. Thanks for touring my music hubs this morning! Music is a great part of life - I would be devastated if I could not hear music daily. I wish though that I could like you say that I play my guitar every day! I don't - it sits in its case just the other side of the desk at which I'm writing right now, but seldom gets taken out! I guss I just have to do something about that,hey? Thanks for sharing some of your collection of instruments. RGraf - I agree. School orchestras and bands coupled with instrument lending programmes can give youngsters a completely new direction and an interest for life. It is sad to see some of the music programs disappear in some schools around here. I love to see children learn new worlds with all the different instruments and be able to express themselves in new ways. I loved this Hub. I am obsessed with musical instruments. I can't really play any other than some African percussion instruments that I have seemed to collect over the past few years, but when I see an interesting instrument, I gotta know about it! I'm so envious of the musically talented! My sister and father are pretty good on multiple instruments. I didn't stick with anything long enough to be very good. My daughter played violin from 2nd to 8th grade, and piano for a couple of years. I hate she gave it up in high school, but I can't seem to convinve her that she'll regret it some day. Enjoyed reading about your collection! Steve - the clarinet is none too easy as a first instrument. But you could easily get back into piano or electronic keyboard even now (because I guess you've given up rugby?) It's never too late. 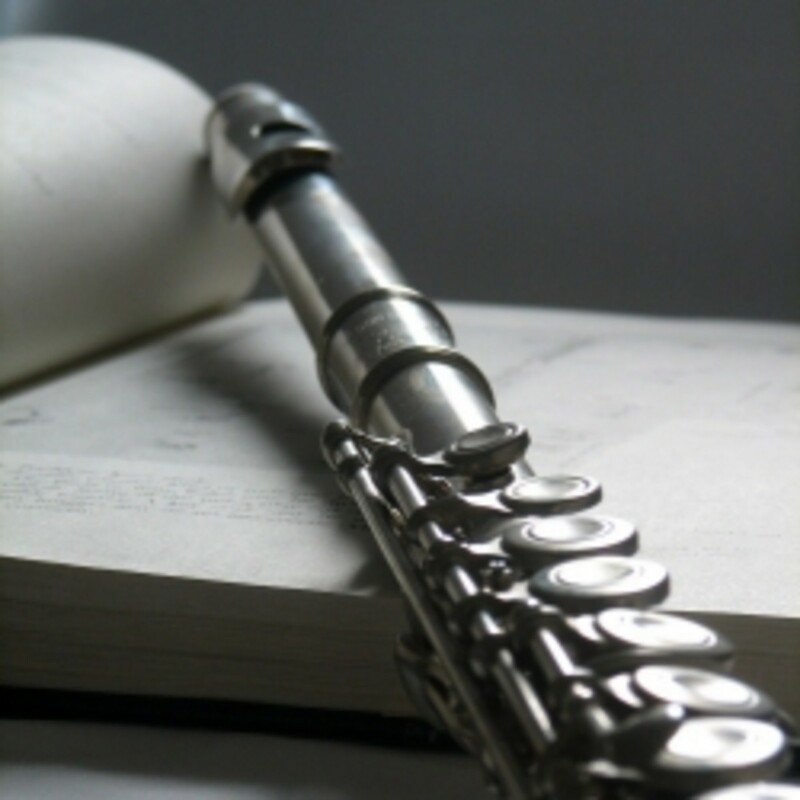 MM - flute &amp; guitar is a great combination, because it can also lead you into composition. My dad wasn't musical but he bought me the flute that got me started. You keep encouraging the lass, ok? My initial foray into music was the clarinet. It lasted six weeks. 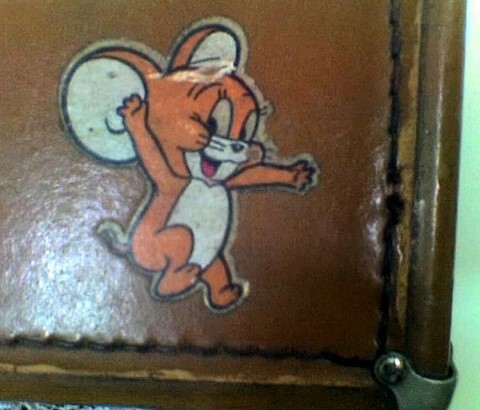 The squeaking was nearly unbearable to me, so I couldn't argue with my parents' decision to cut it off. The piano was different. My father was a professional musician, so I carried just enough of his blood to become tolerably good. Unfortunately, when my piano teacher finally put it to me to choose between piano and sports, I made the decision which almost every teenage boy would make . . . I let go of the piano. One of the deeper regrets of my life. Hi Jen - maybe the most important gift a parent can give is a practical love of music or any of the arts. Thanks for commenting, and keep on playing! Hi, You sure do have quite a collection of instruments and the skill to go with such an impressive collection. I too think it is good for kids to be exposed to music. It is so sad that so many schools drop their music classes. We didn't have much money but my parents made sure we all played an instrument. My sister ended up playing the flute and basson. I played the violin and then taught myself the guitar. My youngest sister learned how to play the clarinet. As a result we can all read music and although I'm the only one who continues with it. We can all pick it up and apply what we learned as children at any time. A true gift from our parents.